How to maximise your impact at graduate recruitment events. The graduate recruitment season is upon us with a seemingly never ending calendar of marketing events to attend – from careers fairs to dinners, and presentations to skills sessions. The work that goes into ensuring these events run smoothly, and are equally well attended by students and your own representatives, is huge with success ultimately measured by engaging with, and eventually recruiting, high calibre individuals. During this season of madness it is easy to overlook the additional effort you may have to make to ensure you are inclusive of disabled students – those who may lack the confidence to ask questions about the support you offer, are concerned about the access at the skills session venue or not wish to ask if they can have the presentation material in advance. Having included information about your approach to disability and the support on offer to disabled individuals on your website and in your brochures, it is all too easy to then forget to talk about disability at the events you attend and the presentations you give. Employers frequently draw on people from throughout the organisation to resource events - including interns, current trainees, junior managers, senior managers, partners, alumni. However, if you wish them to effectively engage with all students, including those who have a disability, you need to ensure they are comfortable and confident to do so. They don’t have to be experts in what the firm does however they do need to have top line information regards this and be able to point people in the right direction. If they can’t do this, and your competitor can, you have just lost a potentially excellent candidate. It is easy to leave the booking of venues to others and to simply assume that it will all be okay. However, if you are serious about being inclusive of all you need to ensure your venues are accessible in the broadest sense and the best way to do this is to take personal responsibility for this. If you want your venues to be accessible it is advisable to state this, rather than simply assume that they will be. And if you have a candidate that needs to use the lift, or a hearing loop, or an accessible toilet – check ahead of time that these are in working order. And finally, be mindful that disabled students may wish to ask questions related to their disability, for example about the support they may require or when they should inform you about their requirements. Research has shown that they are fearful of doing this so make it easy for them. Ensure your reps are happy to approach everyone and feel comfortable to engage in conversations; ensure discretion is exercised when required. 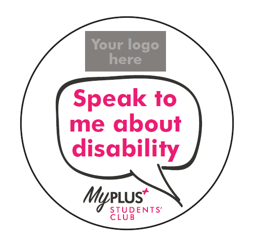 And finally, encourage students to ask the questions they wish to ask; a great way to encourage open conversations is by wearing the MyPlus Students’ Club ‘Speak to me about disability’ badges. Ensuring that these 4 bases are covered, as a very minimum, will be a great way to start engaging with disabled students and encouraging them to apply to you. First impressions are crucial; get it ‘right’ at the very beginning and it will open the door for a smooth journey from application through to them joining your business. Newer PostInternational Day of Disabled People.